Most of my colleagues and clients view me - I think - as a confident, outgoing guy. 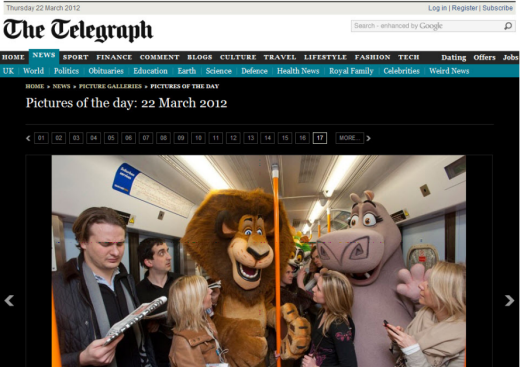 But when we proposed the idea of taking a group of eight ft-tall costumed characters on a commuter train route to be photographed, little did I know that both my colleagues and client would ask me to not just oversee the photos but take part in it as well (see above – I’m on far left studying the newspaper). Planning logistics and preparing for a shoot like this involves a lot of preparation which at times can be very stressful. Everybody pulls together to ensure that the best results are achieved - and when you’ve done all that hard work and you know one or two simple additions (your colleagues and yourself) will make the pictures better you put your pride and vanity to one side and jump in. At the end of the day better results mean better coverage, and PR - for so many clients - is all about the coverage.